backordered Remington 148G HBWC ? I have and these things look like they have been run over by a truck. The center round protrusion is higher than the circular lip around the edge (which is all dented and banged) so now they seat off of a ball ? The bodies are tapered, the bottom measures close to .360" the top is a variable but always undersized. The goop and dirt and crud on them is not good for loading equipment or your gun barrel. After some cleaning and adjustments to my machine I loaded some up. We shall see compared to a nice crisp well manufactured zero. Yes, I just received my Remington HBWC yesterday. The goop you refer to is the lubricant. It does a good job of shooting clean with minimal leading. It does, however, dirty up the press a bit. The taper on the bullets is caused by the knurling process. Since they shoot X-ring at 50 yards, I never bothered to measure them. Ugly girls cook the best food! I would assume that you have never purchased Remington 148gr HBWC's ? That is the way they are. You should have a seating plug that only contacts the shoulder if loading full wadcutters. They may be ugly but they shoot. Multiracer wrote: backordered Remington 148G HBWC ? The bodies are tapered, the bottom measures close to .160" the top is a variable but always undersized. measuring out at .160" they will probably not do well in a .357" bore. send them to me. mine measured at .361" at the middle. mine shoot great in a PPC open barrel. old 10 groove Apex, 14 twist I think? C.Perkins wrote: I would assume that you have never purchased Remington 148gr HBWC's ? My Star has a seating die that should seat on the shoulder. That is until the bulge in the center of the shoulder ring is taller than the shoulder ring ? I fixed my numerical error in type. you can still send them to me! NuJudge wrote: I am still backordered. As am I. Of course, I just ordered them last week. I received mine after about 4-5 weeks. I ordered another 2000. Where did you order them? I only find them at MidwayUSA and they were marked something like "no back orders" and I didn't get any announcement that they were in. I also load with the Star machine. With a case is position, I screw the Delrin plug down until it touches the case mouth. During the loading process, the Remington HBWC is inserted about half-way into the charged case. Then I complete the loading cycle. As the face of the Delrin gets dirty from the bullet lube, I merely wipe it clean with a paper shop towel. This takes place about every 50 rounds. 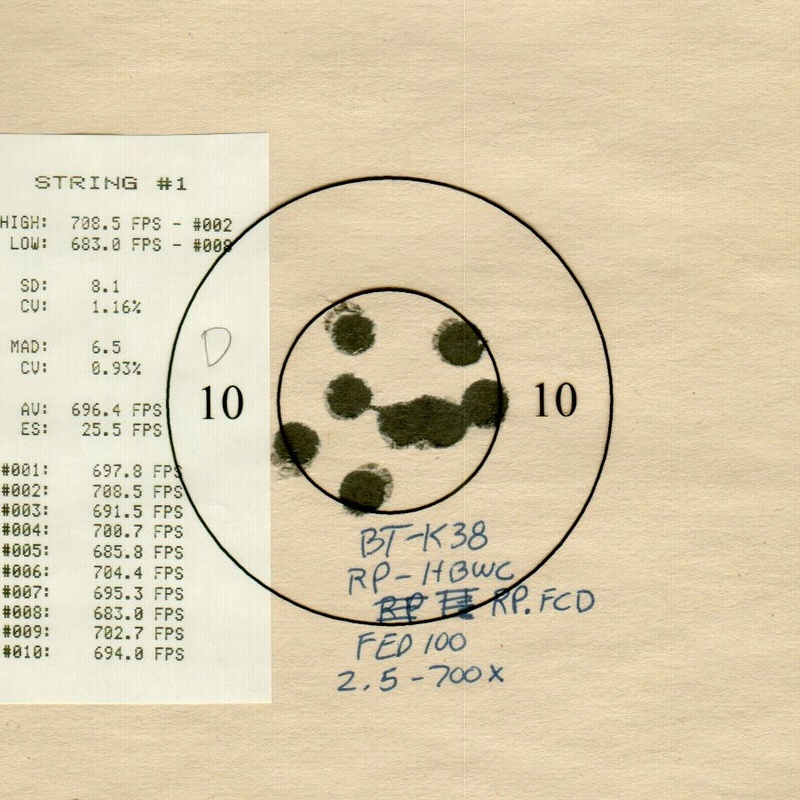 The Remington bullets are very messy to handle; however, the accuracy makes it worthwhile. noylj wrote: Where did you order them? I only find them at MidwayUSA and they were marked something like "no back orders" and I didn't get any announcement that they were in. You have to select 2000 for the quantity to get "Backorder Okay". If you select a quantity of 100, it says "no back orders". You must crimp as a separate operation ? For precision loads with lead wadcutters, you should always crimp as a separate operation. Seating a bullet while you are squeezing the case around it does not do good things to the bullet. With the Star machine, I either roll or taper crimp at the last station. I prefer taper for longer case life. Then, I take the box of loaded rounds and run them through the Lee Factory Carbide Crimp Die in a single stage press. This resizes the brass so it will chamber and not damage the bullet within. Have you used the Lee FCD on .32SWL rounds? I don't think I have ever seen you mention using one before. No, I do not use the Factory Crimp die on 32 WadCutter ammo. I size the brass to suit the diameter of the bullet being loaded. Loading a 0.314" bullet in Lapua brass, I first size the brass to 0.334" and flare only, no expander plug needed.